A BART worker tries to prevent demonstrators from stopping a train from leaving in San Francisco, California. (CNN) -- Transit officials in San Francisco reopened all downtown subway stations Monday evening after successively opening and closing them to stem the threat of spreading protests. "All BART Stations are Now Open, Trains Running On Time," said a release from Bay Area Rapid Transit. 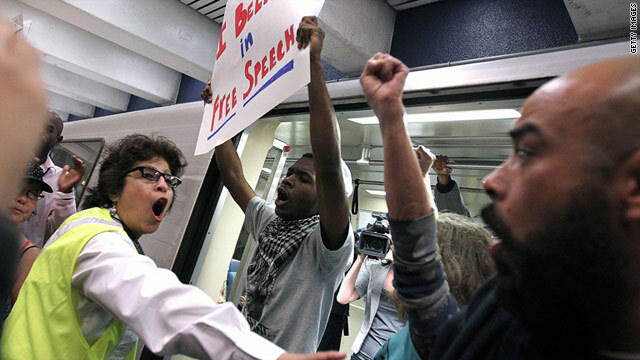 The situation was fluid most of the evening, with officials trying to thwart demonstrators, closing and reopening the Civic Center and Montgomery stations, closing the Powell station, then at least partially reopening Powell to allow riders to disembark. Police officers in response gear stood at the Civic Center station, with one officer on a megaphone telling people, "This is your final warning, the station is closed." On the streets, small groups of protesters could be seen gathering to criticize BART after several shootings involving its police officers -- the latest coming last month and resulting in the death of 45-year-old Charles Hill. Meanwhile, an official with the system stood by the decision to shut off cell phone service ahead of a protest last week. The decision Thursday to "temporarily interrupt ... service at select BART stations as one of many tactics to ensure the safety of everyone on the platform" drew widespread criticism and stirred the well-known hacking group Anonymous to stage an "operation" Sunday. The group urged those supporting its cause to attend a "peaceful protest" at 5 p.m. Monday at the system's Civic Center stop. "What we're going to do is take the appropriate steps within the Constitution," he said. "There are more constitutional rights than just free speech. There is the right to be safe." Last week's protest never materialized. But the decision to cut cell service elicited fresh condemnations from civil liberty organizations, the San Francisco Chronicle's editorial page and others. "All over the world people are using mobile devices to organize protests against repressive regimes, and we rightly criticize governments that respond by shutting down cell service, calling their actions anti-democratic and a violation of the rights to free expression and assembly," Rebecca Farmer from the ACLU's northern California office wrote on the advocacy group's website. "Are we really willing to tolerate the same silencing of protest here in the United States?" Online messages attributed to Anonymous took credit for the apparent hacking Sunday of myBART.org, a link off BART's website that showed a page featuring, among other items, the hacking group's logo -- a smirking mask above two crossed swords, all on a black background. In addition, Twitter traffic related to Anonymous boasted that hackers had been able to get into BART's internal network. Several related items and documents were posted, including one claiming to be "the User Info Database of MyBart.gov." This had e-mails and, in some cases, phone numbers and addresses of hundreds of people. "By (cutting cell service), you have not only threatened your citizens' safety, you have also performed an act of censorship," a seemingly computer-generated voice -- speaking over dramatic music and images -- said in a video posted online Sunday afternoon. "By doing this, you have angered Anonymous." The Federal Communications Commission is collecting information on the matter, with agency spokesman Neil Grace saying Monday by e-mail that "any time communications services are interrupted, we seek to assess the situation." "We ... will be taking steps to hear from stakeholders about the important issues those actions raised, including protecting public safety and ensuring the availability of communications networks," said Grace. Yet on Monday, Johnson emphatically stood by BART's move, made on the same day British Prime Minister David Cameron proposed a crackdown on social media to quell riots. "We made a gut-wrenching decision that was forced upon us by the protesters," Johnson said. "They made us choose between people's ability to use their mobile phones (and) their constitutional right to get from point A to point B."